Syrian refugee Heval Mohamed Kelli was a Clarkston teenager with dreams of becoming a doctor. 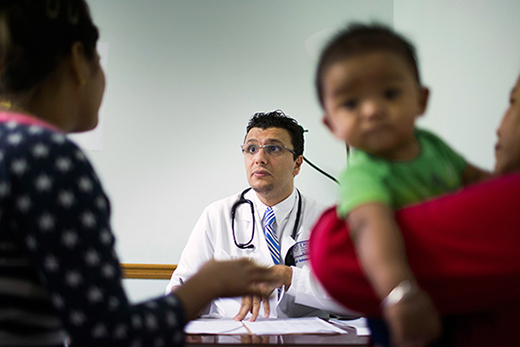 Now his patient care helps immigrants in his old neighborhood and his research connects them to better heart health. During the fall of 2001, in a small restaurant kitchen near Emory, Heval Mohamed Kelli 15MR faced a stainless steel contraption knowing that his family’s survival depended on him figuring out how to work it. His manager gave him a hairnet and told him in Arabic, “You have to wear it. It’s required here even if you are only washing dishes.” It was a busy Friday night at the Mediterranean Grill. Mohamed Kelli heard the Emory students and others place their orders in a language he did not understand, and soon the dishes started coming in. Six miles separated him from his family in Clarkston, where the clock was ticking. The US government would pay for rent for a few months, and then they were on their own in a country where they knew no one. They were more than six thousand miles from Kobane, Syria, where his father’s law practice had made life comfortable enough for his mother to care for him and his younger brother. But they are Kurds, a persecuted minority, and after Syrian police beat up his dad one night in front of the family then put him in prison for three months, the family paid a smuggler to get them out.